Get your update to our ebook. If you are not a member yet and you are receiving this newsletter, sign up to receive your copy here. Welcome members ... as you pull up your mini arm chair for a wee visit today you will find some things have changed. For instance we have a new home for our "Ten Important Tips EBook". You will need the password to access it. A private for members only email will follow this issue. Why isn't it in this one? One reason, this issue will be publicly viewed. But our EBook is for members only. Yes this message will be accessed online. So no we will not be issuing a members password here. However all members will receive it. Just stay tuned to our next private message. Plus it is worth noting that the current location will be deleted today. So you will not be able to view it your usual way again. After today that link will be permanently retired. Hope you will find the new way much more appealing. You will find a new online page plus a convenient place to download your ebook. As always it is free. No fee to access or use the facilities. Hope you come out to visit real soon. We have the tea and coffee on. Go ahead pull up your mini chair and get acquainted. These links work fine in most browsers. That is they are suppose to take you directly to the topic. However if they do not we have provided the links to copy-and-paste into any browser. We have also discovered an issue with Internet Explorer (IE). One that is easily helped by clicking your "Compatibility View" found in the "Tools" section at the top of your browser. That is if you notice that "At-the-Doll-House.com" looks a tad bit scattered. All other browsers give us the look we have created. If not contact us to tell us what browser you currently use. Thanks so much for subscribing to The Minis Zine. Be sure to hit the Facebook "Like" button on the page if you like it. Thanks! Have a great day and enjoy your Dollhouse EZine. 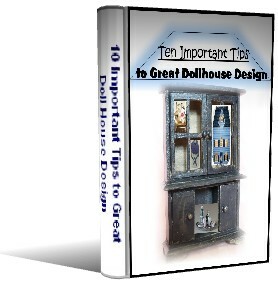 Smart Guide 2 Doll House Design! Styled, Built, Designed! Made 4 You!